Hockey folks argue like any other sports fanatics. They second guess coaches and general managers. They fuss about who deserves to be called “the best” at any position. Even though they’re not as stat driven as baseball people, they do enjoy a good conversation about how some stats are determined. Plus-minus is one of the most hotly debated stats in professional hockey circles. Even though today’s show isn’t about hockey, I should help you better understand what plus-minus is and give you some sense of the debate. A player is awarded a “plus” each time he is on the ice when his Club scores an even-strength or shorthanded goal. 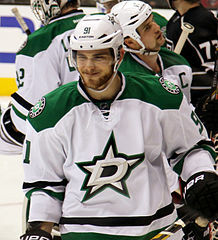 He receives a “minus” if he is on the ice for an even-strength or shorthanded goal scored by the opposing Club. The difference in these numbers is considered the player’s “plus-minus” statistic. Here’s the simple way to view it. If you’re on the ice when the other team scores, you’re minus 1. If you’re on the ice when your team scores, you’re plus 1. There are some other details, but they’re unimportant for our discussion. Ice hockey players who have a poor plus-minus rating hate the stat. Understandably. At best it makes them look unimpressive. At worst, it makes them look detrimental. Is it fair? I suppose it depends on how much weight you give it. It’s just one barometer among many. Players and even general managers in the NHL argue that line mates (the team mates you play with) have an enormous impact on that stat. A weak player surrounded by better players can have a higher plus-minus than a great player surrounded by lesser talent. North of the border (and I’m not talking about Oklahoma), the debate can grow quite intense. Stat freaks point out the problem with it and some have even suggested better alternatives. Ice hockey isn’t played in a vacuum argue the opponents of the plus-minus stat. Neither is business, but it may be a better stat in business than hockey. Hockey makes the assumption that if a player is on the ice when his team scores then he’s doing better than if he’s on the ice when the opponent scores. So far so good. But hockey isn’t an individual sport. A hockey player has teammates playing along side him. And a crucial element of the game resides on the shoulders of a single player, the goaltender. If my goalie is a stud and your goalie can’t stop a beach ball…I’m gonna beat you in plus-minus every time. Business is a team sport, too. But different. Almost 20 years ago I began thinking about how sales performance is measured for individual salespeople. It began with commission-based retail sales. Since the late 70’s and early 80’s I had been accustomed to using a variety of meaningful measurements to lead sales teams. In retail there have long existed some telling stats. Closing ratios may be among the most looked at stat among salespeople. It simply mean, how many prospects out of 10 did you sell? If you talked with 10 people and sold 3, then you’re closing ratio is 30%. Today you mostly hear people call it conversion. How many prospects did you convert into paying customers? In web terms, how many visitors to a website did you convert to take whatever action you wanted them to take? Eyeballs on a web page matter, but not if we’re unable to convert them into something more meaningful – subscribers, email opt-in’s, buyers, or whatever else you’re trying to get them to do. In the television world, producers want to attract as many eyeballs as possible so they can sell advertising. The more eyeballs on a TV show, the higher premium they can charge for 30 second spots. The advertisers want more eyeballs on their ads so they can drive business. Maybe they want more diners to their restaurant, or more drinkers of their beverage, or more shoppers into their showrooms. Whatever it is, you can bet it being measured 8 ways to Sunday. Conversion is king. We all need to convert shoppers into buyers. When we focus merely on attracting more prospects and we neglect looking closely at conversion, it’s like working to catch more fish when our holding tank as a hole in it causing us to lose the fish we’ve already caught. Conversion is a middle-of-the-funnel problem, not a top-of-funnel one. Average ticket is another common retail stat. If we sell to 10 people and total their invoices, then divide by 10…we’ve got our average ticket amount. The higher the better. Sorta. A higher average ticket assumes customers are buying more, or buying higher end stuff. It also assumes that profits will go up as ticket prices do. Of course, some assumptions can prove wrong. For example, I’ve seen some salespeople who had a high average tickets, but they weren’t making as many sales as their teammates because they were cherry picking shoppers. If a shopper was interested in something that wasn’t high end, they’d abandon them. Pathetic customer service resulted in a higher average ticket. All that glitters ain’t gold. Things aren’t always as they appear. I like plus-minus in some situations because it assumes an equal opportunity for everybody. Leaders should do everything to make sure people have the best opportunity for success. They don’t always do that because they let their preference for some people override their sensibilities. Since I started out using sales as the example, let’s stick with that. In selling not all opportunities are equal. Talk to any outside sales force and you’ll quickly hear about Joe and his luck in having the best territory in the company. “He wins every year. I would too if I had his territory,” cry all his co-workers. And they may be right. But maybe Joe built the territory. Or maybe Bill retired 3 years ago after creating the number 1 territory in the company and Joe inherited it. Would plus-minus help in looking at Joe versus his co-workers? Not likely. But there are lots of sales situations where it might work wonderfully. Ten guys are working in a car dealership’s new car sales department. They’re all working 6 days a week. They all put in about 50 hours a week. They’re all selling the same inventory. They’re all at the same location. But they have different experience, different skills and different client bases. Plus-minus helps us examine and put the attention on contributions. That’s why I like it. On the downside (for the salesperson), it can also focus attention on deficiencies. Maybe there are no perfect measurements or stats. In anything. But some clearly are more meaningful than others. Sales organizations are notorious for establishing indiscriminate quotas based on feelings or thoughts. I’ve sat in too many meetings where leaders wanted to give one guy a higher quota because of his experience or skills. At the same meeting they want to give a lower quota to a person they feel is less capable, but may have been on the job just as long. Is that fair? I don’t think so. I think it over burdens the more skillful and under burdens the less skilled. Remember the old curve grading in school? If you were on the bottom of the curve, you hated it. If you were on the top, you loved it. Of course, some brainiac would get a 100 and the rest of us suffered. If only we’d been assigned to a class of morons we could have had higher grades. It didn’t have anything to do with our lack of study or preparation. We were simply outmatched by geniuses. Story of my life! Here’s what I think matters in our companies when it comes to measuring performance…who is performing above average and who is performing below average? Suppose we’ve got 15 salespeople. Our total monthly sales are $2.43 million. If our sales team is performing identically, then each salesperson will have produced $162,000 in gross sales for the month. But no sales team is identical. Including ours. We take a closer look at our 15 people and discover that 4 of them have brought in just under $2 million, leaving the other 11 to bring in only $440,000. It’s a disparity that blows our mind, but these things happen all the time in the world of selling. The average (the total sales divided by the total number of salespeople) may not tell us the whole story, but the story it does tell is compelling…because 4 of our people are blowing the average away while the bulk of our team are performing dreadfully below the average. If $162,000 is the average, we’ve got 11 players who appear to be averaging only $40,000 ($440,000 total brought in by 11 of our 15 salespeople). They’re performing only at 25% of the average. Four people on our team are producing $1,990,000. They’re averaging almost $500,000 each. That’s over 3 times the average. That’s about 210% over the average or over 8 times the productivity of the other 11. Lots of costs associated with those 11. We’re probably not supporting the 4 superstars as well as we should because we’re carrying too much cost with those 11. But we’re not finished. We really have to examine each player. Of the 11 we’ve got 1 who is performing better than the rest. Mary’s still not hitting the average, but she’s far and away doing better than her 10 other bottom feeder peers. She’s still a minus player, but she’s not as minus as most. On top of that, she’s the person with the least amount of experience or seniority. We think with a bit of help she could climb out of that pit so we invest in her. We pair her up with a mentor from among the top 4. We challenge her to learn all she can. Another of the 11 was historically an above average performer, but recently he’s slipped. Luke was never top tier, but he was more consistently above the average line. We sense that he’s got it in him to do better, but we don’t know what’s happened to him over the last 60 days or so. We set out to find out. Turns out he’s had some personal issues with aging parents. He’s had to devote more time to caring for a father whose health is failing. He and his wife took in his parents three months ago. Since then, life has drastically changed for him. It shows in his work. Over time it becomes clear to us that we need to support the people with higher performance more. We decide it’s time to divide territory responsibility and get a better grasp of our own commitment to our customers. The company decides to restructure responsibilities and assign accounts. And to design a new way of working. Luke is promoted to a new position inside the company. He’ll be off the road now and he’s going to spearhead over 80% of the accounts previously handled by all 11 of the poorer performers. These are accounts that range from small to potentially large. There’s no arguing the history though and the company feels Luke may be able to provide better service and support virtually than a larger team wasting time and resources in travel. Besides, he’ll have 2 assistants and together this team of 3 will be able to really concentrate on helping develop these accounts (in some cases on getting these accounts built back up to a prior status). The two assistants are among some of the 11. They happily accept their new roles because their bonuses are going to be team based and they too are no longer on the road. Four of the 11 are now situated. Seven are on the block to be cut from the team or reassigned. Now 5 superstars (4 really, plus 1 in training) are on the road responsible for the bulk of the monthly revenues. The accounts that have historically been bringing in the bulk of the revenue are divided among this team. Three others are going to be at HQ handling the rest of the accounts. The 5 road warriors have found a new level of success. The company has poured resources into them fostering a greater degree of unparalleled service and support. Customers are responding very positively. Sales are up over 30%. This group of 5 are now responsible for monthly sales exceeding $2.7 million. The differences between the 5 fluctuates month to month as one person gets top honors one month, then somebody else the next. There’s no more than 15% difference among them, from top to bottom. The inside team of 3, led by Luke, are doing exceptionally well. Luke has even hired a 4th person to join the team due to the success. Part of the 30% increase of the road warriors is due to Luke’s hard work to develop 2 critical accounts that had slipped in recent months. Luke nursed them back to a state where they were assigned to the road warrior team. His team was compensated for their success, not penalized. The company paid the entire team a nice quarterly bonus when it moved those 2 accounts. That fuels Luke and his team to see if they can do more of that in the future. Last month the company gathered all the people in sales – Luke with his 3 employees and the five road warriors. Nine now in total. Nine doing more than 15 were doing before. The company is working out a plan to fairly compensate the entire team for the sales success. Luke drafted a plan to not just serve the accounts not being handled by the road team, but to support all the accounts. It’s in the 3rd stage of revisions, but everybody is excited about the prospect of more growth (and higher paychecks all the way around). No, it doesn’t always go this way. And I’ve not talked about the bad news of 7 people whose jobs were at risk because they were performing woefully below average. But the truth is, people are either contributing to the success of an enterprise or they’re a negative influence, detracting from the enterprise’s ability to succeed. I’d argue that anybody who is neutral – they’re not draining nor contributing – is a drain. I’m not arguing that we should terminate all the players who are below average, but we’d better we figuring out why they’re not even average. Soar with your strengths. It’s a philosophy I have led by for decades because it works. And I believe in it. Give me those top tier performers. Let me pour resources to help them achieve 5% more per person and I’ll conquer the market. Plus minus let’s us determine who is helping and who is costing us. But better than that it gives us a measurement we can use to manage the performance of our work. People want to contribute. People want to excel. Too often sales management is about arbitrary quotas that frustrate salespeople. “You’re not supposed to hit it,” he said to me. I was a young road warrior busting my tail to hit quotas that seemed impossible because they were. The company had made sure of it. When the VP told me that I wasn’t supposed to hit them, you’d have thought relief would have come over me. It didn’t. Instead, I felt lost. Stupid and lost. Here I had been working feverishly to accomplish a goal I thought somebody smarter than me had devised. Surely they know something I don’t. So I went for it. And failed. Now, I no longer trusted my employer. I found it difficult to work so hard for them any more. I had been betrayed by a company playing a game they never let me in on. They lied to me. Had I been allowed to see where I stood relative something measurable and fair, I’d have continued to bust my backside. But the truth was, in my circumstance there was only one way to know if you were doing a good job – contributing – or not. That was whether or not the VP told you you were. It was all far too subjective for me. Plus Minus May Look Different For You. That’s Okay. Don’t get too hung up in the details of all this. Rather, I’d encourage you to find ways to analyze the performance of your sales team so you can be certain about the contributions. My main point years ago in coming up with this and other tools, was so I could move away from the “I think you’re doing a good job” kind of leadership, which is really NO leadership at all. My innate belief that people want to contribute led me to devise tools and plans that would foster people to perform at higher levels than they might otherwise. We all need feedback. We all need positive reinforcement that what we’re doing is working, or is the right thing. Leaders and managers who neglect to come up with or embrace anything available to accomplish that are letting their people down. Your people deserve to know if they’re making a positive difference. And they deserve to be supported so they can make an even bigger positive difference in the future.